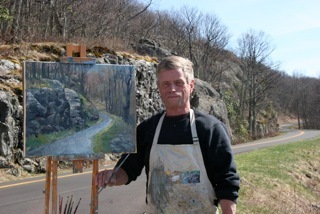 M. Stephen Doherty earned a Master of Fine Arts degree from Cornell University; taught art in public schools, colleges, and workshops; worked for an art-materials manufacturer; served as editor-in-chief of American Artist Magazine for 31 years; and is now editor of PleinAir Magazine (www.outdoorpainter.com). PleinAir Magazine is a bimonthly print and digital magazine dedicated to people who enjoy artwork based on direct observation of nature. He has written a dozen art books and hundreds of magazine articles; exhibited his paintings in solo and group exhibitions; served on the advisory boards of art schools and artists' organizations; and judged art exhibitions for museums and art societies. Doherty and his wife, Sara, moved to Waynesboro, VA in December, 2012, and both have been thoroughly enjoying the local community of artists and art enthusiasts.